The importance of a good early schooling as a racehorse is an imperative. 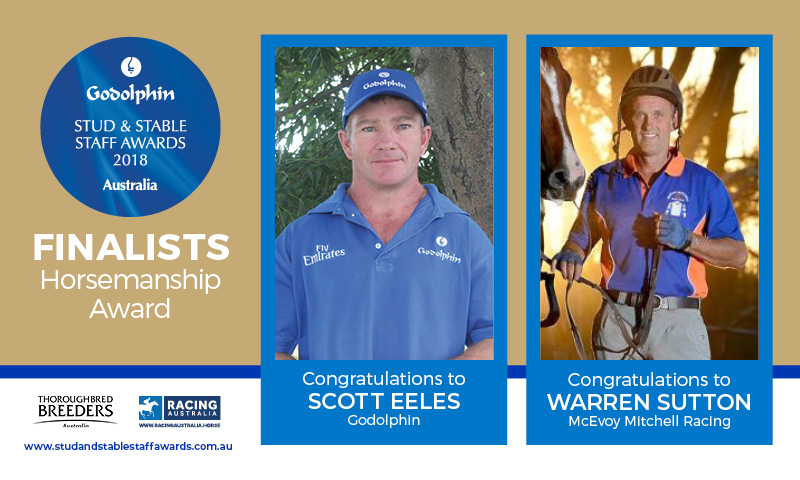 So, it is that two outstanding providers of such an education, Scott Eeles and Warren Sutton, are the finalists in the GSSSA Horsemanship category. As Godolphin breaking-in foreman, Scott Eeles is one of the first people to get his hands on the foals born at Godolphin’s Australian farms. “I’ve had the privilege of watching horses who I’ve helped to develop go on to win some of the best races in Australia,” said Scott who, along with Godolphin, is also heavily involved in Riding for the Disabled in the Hunter region. The rise of Tony McEvoy among the ranks of Australian trainers has been remarkable. This year alone, Tony set the early running among the juvenile ranks with the filly Sunlight, and is enjoying one of his best seasons. One of the reasons, according to the trainer himself, is that he has Warren Sutton educating his young horses. “My two-year-old results in the past few years are testament to the work of Warren Sutton, who I believe is one of the most accomplished horsemen in Australia,” said Tony. For his part, Warren is delighted to be nominated. “For someone like Tony to think enough of me to put me forward for this award is fantastic,” he said.